The parish of Sculthorpe lies just west of the market town of Fakenham, the first village along the A148 heading west towards King's Lynn. 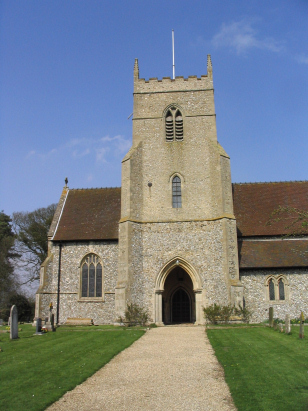 The parish is a curious shape, a triangle with base formed by the A148 and two built-up minor roads meeting close to the church. The whole triange being empty of properties except those fronting the roads. Sculthorpe is a substantial village and forms a populat place to live for those working in Fakenham. Despite its looks the church is very much a Voctorian creation with much of the original fabric demolished in the 18th century. What remains of the original church indicate that it was a typical 14th century date and in the Perpendicular style common to Norfolk. 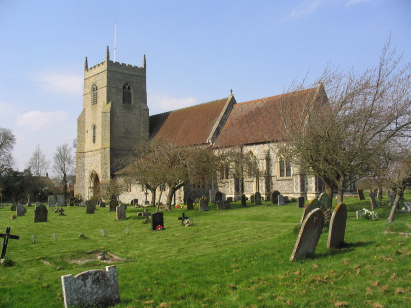 The church stands in a wide expanse of park-like graveyard and is well-kept and a credit to the village. The two registers which form this transcript were deposited together and filmed on microfilm MF1396 in the collection of the Norfolk Record Office. This film is quite a recent filming, perhaps a good thing given the eccentricities of the hand-writing of the major incumbant, with clear and contrasty images. As stated, however, the hand-writing through the majority of the period was in a single very difficult cramped hand and some interpretation has been required in some cases to establish the surnames concerned. It is to be expected that some errors may have occurred as a result of these difficulties but it is to be hoped that these are few in number.